Windows 8 Tour - Explorer Toolbar and Ribbon! Windows 8 Tour – Explorer Toolbar and Ribbon! The windows 8 development team is pulling out all the stops for the next version of the operating system. Version 8 brings many changes, and some of them even include reviving legacy features from earlier versions of windows. Recommendations from users are not only being considered, but also included in the OS. Listed below we have the highlights of what you can expect to see in Windows 8 explorer. Hopefully by now you are accustomed to the infamous Microsoft Office ribbon, because it’s making the jump to a full-time position within Windows 8. We’re also seeing the return of a beloved old friend: the UP button. If you’d prefer to ditch the ribbon and gain precious vertical screen real-estate, then the minimized mode offers you emancipation. This feature comes at the bequest of well, everyone… According to market research from Microsoft, 83% of Windows 7 PC users are on a 1366 x 768 screen resolution, a popular laptop resolution. And, while desktop users might be on a larger monitor, they are still in the widescreen 1.3 format. Compare the difference. What are some of the big changes you notice between Windows 7 and Windows 8? As you can see in the screenshot below, Windows 8 Explorer doesn’t sacrifice any vertical space by introducing a full-blown ribbon. 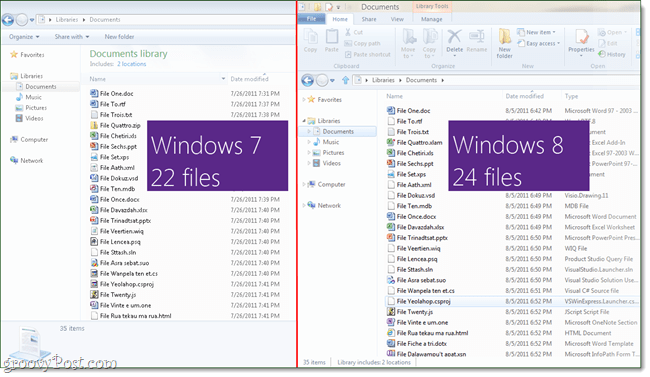 In fact, Windows 8 has even more space than Windows 7 did; it can fit 2 more files within the exact same resolution as Windows 7. Overall the changes to explorer are looking pretty good, and it is mostly finished. There are still a few tweaks left to do, but Microsoft is sticking to it’s guns and this round it is looking to make the latest version of Explorer all about the experience for regular AND power users –even if that means admitting they were wrong to remove old features like the UP button. Goals of the new Windows Explorer We set out to accomplish three main goals with this new version of Explorer. 1 – Optimize Explorer for file management tasks. Return Explorer to its roots as an efficient file manager and expose some hidden gems, those file management commands already in Explorer that many customers might not even know exist. 2 – Create a streamlined command experience. Put the most used commands in the most prominent parts of the UI so they are easy to find, in places that make sense and are reliable. Organize the commands in predictable places and logical groupings according to context, and present relevant information right where you need it. 3 – Respect Explorer’s heritage. Maintain the power and richness of Explorer and bring back the most relevant and requested features from the Windows XP era when the current architecture and security model of Windows permits. Excellent post! I may not hate the W8 ribbon as much as I thought. Honestly though, the only button I ever use is the “change view” button – the rest I find is done better through context clicking. I assume that “tools -> options” will be at the bottom of the “File” menu like it is in Office 2010? Unless there’s a better way to turn on hidden file and known extension views in W8? Oh, and given that the Windows 7 status bar can be re-sized, it might not be true that the W8 explorer has more space than W7 (though it probably does with the minimized toolbar). Yeah – I think Microsoft learned their lesson with the Ribbon back on Office 2007 when the community revolted. From the looks of it yes, the Ribbon has the File -> context menu just like Office 2010. I’m going to bet you can get to most of the options from there.